by rdiesu on May 27th, 2016 · Comments Off on Join us in Philly for a Clean Energy Revolution! 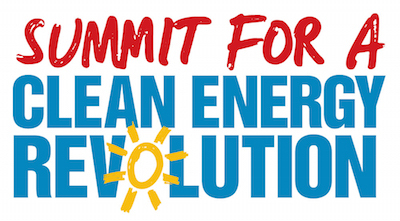 Before we march in the streets calling for a Clean Energy Revolution on July 24th- join us by taking part in educational workshops, organizing skills trainings (developing a campaign strategy, lobbying, media skills) and strategy sessions at the Summit for a Clean Energy Revolution on July 23rd! Come prepared to acquire new skills and strategies to take back to your local campaigns and to meet people working on similar efforts in their communities across the country. Sign up here! http://bit.ly/2494xhT. Speakers will include those on the front lines directly affected by the fossil fuel (including many members of the our advisory council), those working to transition to a clean energy future, as well as Robert Howarth, Reverend Yearwood, Wenonah Hauter, Joe Uhlein and more. Join others who are working to ban fracking, keep fossil fuels and uranium in the ground, stop dirty energy infrastructure and justly transition to 100% renewable energy! You can register to attend the Summit here: http://bit.ly/2494xhT. If you are planning to attend the summit and need transportation to Philadelphia, please email Laura at lchamberlain@fwwlocal.org (include your phone number, city and state) in order to learn more about hosting or joining a carpool. You can also check with Laura about housing options.